Educate stakeholders on the use of ITS Standards. Identify the ITS Standards that support the interfaces identified in the regional ITS architecture. Educate stakeholders on the importance of standards, especially with respect to cost, risk, and interoperability issues both within a region and when connecting to neighboring regions. Build regional commitment to consider and deploy ITS standards-conformant system interfaces. USDOT web site (http://www.standards.its.dot.gov/) that provides ITS Standards status, deployment-based outreach information, and lessons learned. Interface Control Documents (ICD) from all stakeholders' systems to identify standards currently in place. In this step, applicable ITS standards (or interim standards) are identified for each information flow in the regional ITS architecture. Establishing regional and national standards for exchanging information among ITS elements is important not only from an interoperability point of view; it also reduces risk and cost since a region can select among multiple vendors for deployment products. The ITS community recognized these advantages and therefore encouraged Standards Development Organizations (SDOs) to create ITS standards between the most critical ITS element interfaces. A report identifying ITS Standards supporting regional and national interoperability is a required component of the regional ITS architecture as identified in FWHA Rule 940.9(d)7 and FTA National ITS Architecture Policy Section 5.d.7. ITS Standards address interfaces between ITS elements, so prior to this step, the stakeholders should have reached consensus on the information flows between each pair of ITS elements in the region. A set of standards can be identified for many of these information flows. The first step is to educate the stakeholders regarding ITS Standards. Consider arranging an ITS Standards training course for the region. Take a look at the ITS Standards that are currently in development; descriptions and monthly status for each ITS Standard can be found at the USDOT ITS website at http://www.standards.its.dot.gov/. Also included on this website are contact numbers, standards advisories, fact sheets, deployment lessons learned, peer-to-peer support, and outreach material as well as links to websites maintained by the various Standards Development Organizations. For standards that are not published, it is advisable to contact the working group chair to learn about the current status of the standard as well as the advantages and disadvantages of implementing the standard before it is published. There are some basics to know prior to examining the list of ITS Standards. In general, each information flow has up to three types of standards that are relevant: a message set standard, a data element standard, and communications protocol standards. Especially in the area of communications protocols, there are various technology choices that a region can make. Making the best choices depends on multiple factors, including throughput (how much data must be transmitted or received on the interface), network topology (how the ITS systems are connected together), infrastructure (fiber optic lines, leased land lines, etc. ), and communications services (publish/subscribe, etc. ), among others. At this point in the process, educate the stakeholders sufficiently to identify the potential ITS Standards for each interface, but leave final technology choices to the communications experts during project implementation. Typically, these decisions are made as part of the Plans, Specifications and Estimates (PS&E) for each project. Review the standards currently used by the stakeholders. It's possible that many industry standards are already in use in the region. Encourage stakeholders to examine their existing interfaces and determine whether this is indeed the case. Discuss options for converting or translating these interfaces to ITS standards over time. Has the ITS standard been approved or published by the SDOs? Has the ITS standard been adopted by multiple vendors or system integrators? Has the ITS standard been tested, either informally by the vendor, or through the formal ITS Standards Testing Program funded by FHWA? Is there an amendment to the ITS standard or is a new version currently in the works, and if so, how much of the standard will change as a result? Along with understanding ITS Standards and how they might apply to the region, consider also what others are doing. There may be decisions regarding certain standards made by a DOT that are to be applied across the entire state. Also, look at what neighboring jurisdictions and states may be doing. Working together and sharing resources will reduce risk for everyone and increase the integration between systems across the state and between states. Prior to initiating implementation of a given ITS standard, consult early public sector deployers and discuss the lessons they learned. This will help gauge the maturity of the standard, and better quantify any deployment risks that may be involved. Regions should create a regional standards strategy or plan that shows how the region will migrate toward ITS standards conformance. As part of that effort, stakeholders should reach consensus on an interim approach if the ITS standards applicable to the region's interfaces are not yet mature. It is usually better to implement the relevant parts of an ITS Standard than to ignore it. Schedule meetings to keep stakeholders informed regarding Standards. Assign various Stakeholders to report on different Standards so that it isn't too much a burden on one stakeholder or the champion(s). Build consensus and support for sharing this task and document stakeholder responsibilities. In addition to the interface standards that are being defined for ITS, a range of other regional standards may be considered that would facilitate interoperability and implementation of the regional ITS architecture. For example, standard base maps, naming conventions, measurement characteristics, georeferenced location standards, and organizational structure identifiers can all facilitate the meaningful exchange of information between systems in the region. These types of regional standards should also be considered and can be included in the standards documentation at the discretion of the region. The Rule/Policy requires, where appropriate, that federally funded ITS projects use ITS standards that are adopted by the USDOT. No ITS standards have been adopted by the USDOT as of April 2006 but over 100 ITS standards are in development and/or published by various Standards Development Organizations (SDO). As an SDO-approved standard matures and its market expands, USDOT may decide to adopt it through a formal rulemaking process. Consult the USDOT web sites on ITS standards (http://www.standards.its.dot.gov/) and ITS architecture and standards conformity (http://www.ops.fhwa.dot.gov/its_arch_imp/policy.htm) sites for the latest information. The National ITS Architecture provides a list of all ITS Standards applicable to each information flow (or "architecture flow"). The title, document number, and responsible SDO are included for each flow. Turbo Architecture provides an ITS Standards Report based on all of the architecture flows selected in the region. The report lists all standards associated with each architecture flow, either sorted by standard or by interface. Select the specific ITS standards that reflect the regional standards strategy. When using Turbo Architecture, try to minimize the number of user-defined architecture flows unique to the region. Since ITS Standards are created using the National ITS Architecture as a framework, ITS Standards have only been created for the interfaces identified by that framework. As a result, you'll be on your own when you need to determine how to standardize those user-defined interfaces. Turbo Architecture 3.0 and later versions provide the user with the capability to add standards and map them to information flow triplets (source, destination and information flow name). In addition, Turbo Architecture now allows the various groups of ITS standards to be tailored to reflect the region's strategy. For example, the user may remove standards that will not be deployed in the region from Turbo output displays and reports. Many of the SDOs maintain websites where you can download interim copies or order published copies of ITS standards, obtain status information, take a look at other regions in the midst of deploying ITS standards, obtain contact numbers, and participate in various technical question and answer groups. The USDOT ITS website contains links to the majority of these sites. At this time, many ITS standards are free of charge to deployers. Every regional ITS architecture must include a list of ITS standards to be compliant with the Rule/Policy. It is also important to have a plan for how the region will migrate towards use of these standards over time. The ITS Standards report should identify all selected Standards for each information flow in the region. The standards list should include ITS standards and any other standards that are used or are candidates for use in the region. The list should not be constrained so that it includes only the default list of ITS standards that are included in Turbo Architecture; other standards should be included as appropriate. For example, many states have defined XML and web services-based interfaces to support their CVISN deployments. Other regions have agreed on a regional standard for emergency vehicle signal preemption. Standards that have been selected in the region to support ITS implementation should be included in the region's standards list, whether or not they are in the default list of ITS standards. The list should also be tailored so that it does not include standards that will not be used in the region. For example, a region that has opted to use XML, SOAP, and web services exclusively for center to center communications should remove CORBA and DATEX-ASN standards from their list of applicable standards. For best results, a region should move beyond a list of potentially relevant standards to define a plan for how the region will migrate to use relevant standards over time. A plan is important because standards implementation is a regional issue, not an issue that can be completely or efficiently addressed by individual project sponsors. An ITS Standards Plan defines the current status of the region with respect to standards use, specifies where standards should be used in the region (building on the standards list described above), and defines a migration path from where the region is to where the region would like to be. Like ITS itself, ITS standards will be implemented incrementally in the region as standard interfaces are implemented through a series of ITS projects. Interim approaches should also be documented for interfaces that will not be supported by mature ITS standards in the deployment timeframe. For example, the interim approach could identify current regional standards and show a migration path toward use of ITS standards once they become available. The ITS Standards Plan should also reflect any other factors that might affect regional standards deployment such as a statewide standards strategy, or current and planned use of ITS standards by adjacent regions. An outline of the key content of a standards plan is included in Figure 24. ITS standards reports are a common component of regional ITS architecture documentation. One of the key challenges for this particular output is finding a way to present this large body of information (multiple standards for every information flow) in a concise, useful format. Two example outputs are presented in this section. The first example is an excerpt from a "Relevant Standards Activities" report based on the Franklin, Tennessee TOC ITS architecture, shown in Table 14. In this output, each relevant ITS standard is identified along with the interfaces that it supports. By listing interfaces rather than individual information flows, the length of the report is reduced considerably. The more detailed information flow to standards mapping information is maintained in a Turbo Architecture database. 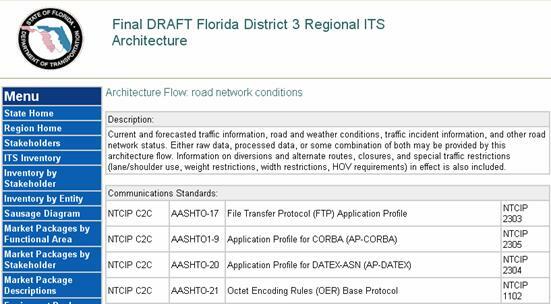 In the second example, shown in Figure 25, an on-line hypertext presentation is used to organize the standards information for the FDOT District 3 regional ITS architecture. This excerpt from their web page shows a portion of the standards information for the "road network conditions" information flow. A separate web page like this is available for every flow in their architecture. (Note that this list of ITS standards has not yet been tailored for the region). The hypertext presentation allows rapid access to a concise report of the standards associated with each information flow. 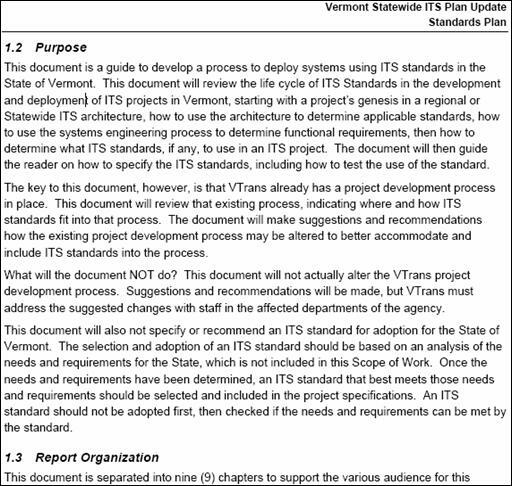 The state of Vermont included a Standards Plan as one of the components of its Statewide ITS Plan. A brief excerpt of the Standards Plan is shown in Figure 26. This document is meant to support managers, planners, specification writers, and project managers from transportation agencies in the State of Vermont. The Plan identifies current practices and recommends a standards development process and guidelines for evaluating all existing and future ITS technology and systems deployed. An example from the Eugene-Springfield metropolitan area in Oregon shows a partially tailored list of standards that is organized by projects. 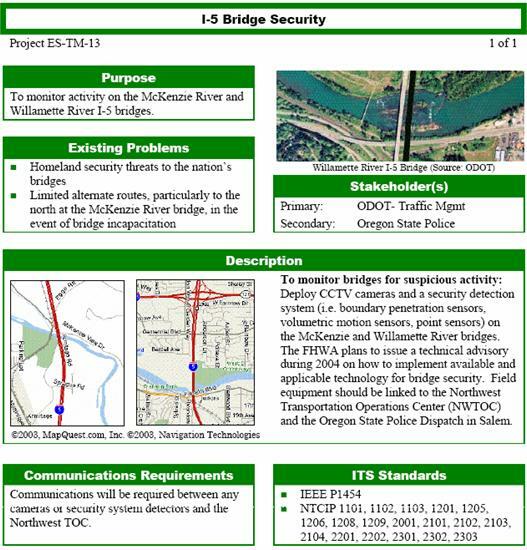 Figure 27 is an excerpt from their "Regional ITS Operations & Implementation Plan for the Eugene-Springfield Metropolitan Area, Chapter 7: Deployment Plan." In their deployment plan they discuss how and when projects will be deployed to implement the components of their regional ITS architecture. For major near-term projects, the ITS standards that pertain to that project are listed along with a description, funding, and other information. This method narrows the focus from over 100 ITS standards to just the ones that are relevant to the stakeholders that are concerned with that one project. Note that in some cases, specific ITS standards have already been identified by the region (e.g., NTCIP 1205: Object Definitions for Closed Circuit Television (CCTV) Camera Control). In other cases, the region still needs to decide which communications standards will best meet the needs of the project, which will be determined during the design phase. For example, the project designer will determine whether point to point or point to multipoint communications are required, determine whether direct RS-232 communications or FSK modems will be used, and select either NTCIP 2101, NTCIP 2102, or NTCIP 2103 accordingly. The regional ITS architecture standards list includes all three viable options and preserves the choice for the project designer.